I can hardly believe it is Thursday already. Seems like we were just enjoying the weekend at the annual MCC sale, raising money for Third World relief. Quilt auctions are really interesting. You just can't tell ahead of time which quilt will cause a bidding war--all it takes is two people wanting the same thing. My friend's sister made this quilt from my first published pattern, Charm Parade. She added some borders to increase its size and it was really fun to see. Early on Saturday morning, there is a 10k run and two-mile Fun Run. Have you ever done a fun run before? I hadn't, and I really hadn't expected to do it this year either. Until I got a text at 10 p.m. Friday night from our son, Aaron, wondering if either Mark or I could walk with the kids in the fun run so he could do the 10k. I nominated myself. Turns out I walked with a friend and her 4-year-old as Charlotte and Levi walked/ran with a group of their friends. Levi did two miles in 19:19, which I thought was pretty amazing for a 7-year-old. Charlotte came in fourth place for most closely predicting how long it would take her to do the two miles. Every year they design a new t-shirt. I think they chose their colors this year based on a local restaurant. What do you think? Good food and being outdoors on a nice day makes you feel like relaxing a little bit. In quilting news, this is a smaller version of Gabe's quilt (reveal tomorrow--please come back to see it) that will be up for auction next year at the MCC sale. It is being hand quilted by the quilting group at our church. I've been working on some fun projects myself--making hexies from Bella Caronia's new line for Windham Fabrics, Spring Bloom. And finally cutting into my precious stash of Henna Garden by Portabello Pixie. Of course, I had to see what this pretty fabric would look like by using the Waterlogue app on my iPhone. I think I will print some of these out and use them for notecards. We have no clue who this Siamese cat belongs to, but every single night, at dinner time, it likes to take a shady little nap on our roof, under the Japanese maple tree. Yesterday we got out the new bubble guns. And have you seen this on the Martingale blog? My qulty name is: FluffyBindingBinder which I thought was funny as I love to sew binding. LOL!! I still need to download that waterlogue ap...everytime you use it, I love the results. And we are off to see our grandson next weekend and see that a bubble gun is a must buy! Thanks for the inspiration today! Zippy Batting Binder here! (that sounds uncomfortable!) Love your randomness! And bubble guns! I love the Henna Garden rainbow circle, can't wait to see what you do with it! hi - I think the cat is a long hair from the picture, but I couldn't really tell. If it is it is probably a Himalayan aka Colorpoint Persian. Love the Gabe quilt. Well done on participating in the run! Sounds like a lot of fun! I'm really looking forward to seeing Gabe's quilt :) I finally have random on my blog this week too, though it's just a short one! Hugs from Quilty Sewing Machine, hahaha! Well, that was fun...and actually quite true - I'm Longarm Binding Machine!!! Now I just need to figure out how to finish the binding on my longarm so I don't have to do it on my DSM!! Looks like you had a busy and fun-filled weekend!! Lots of fun things as usual Cindy. 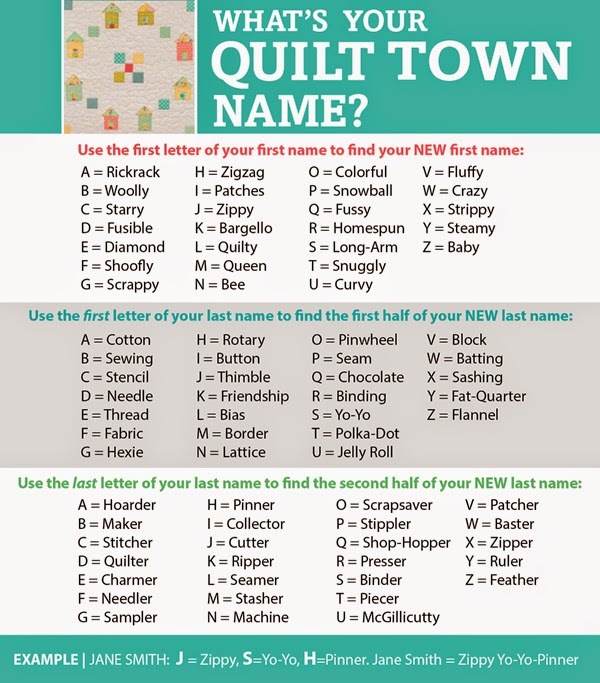 My quilty name Is Rickrack NeedlePresser. Kind of like the sound of it. Hehee. I am Queen Friendship Binder. Thanks for the chuckle this morning. I was thinking that the cat on the roof, followed by the new bubble gun, might be a pairing. But no? Fun to see all these great items. I love reading your blog--it makes me feel I've had a great talk with you!